Mamie Craig Williams was born in Lawrenceville, Georgia to J. Craig Williams and Rebecca Byrd.1,2 She likely married Otis S. Kell[e]y some time after the 23 January enumeration of the 1920 US Federal Census which listed Otis as single with his parents Giles and Ada on Crogan Street in Lawrenceville.3 At best, the marriage lasted less than two years. The couple being parted by the death of Mamie. Lawrenceville, Ga., August 29 -- (Special.) -- Mrs. Otis Kelley, age 30, died at a local hospital in Atlanta early Sunday morning of appendicitis. The remains were brought to Lawrenceville and the funeral and interment held at Fair View church Monday. 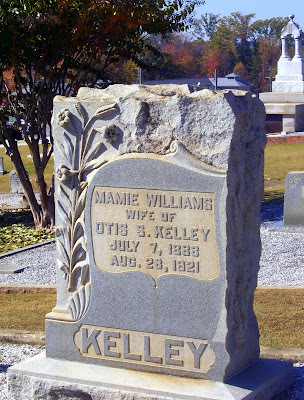 Mrs. Kelley was formerly Miss Mamie Williams, of Oakland. She is survived by her husband and father, J. Craig Williams, and two sisters, Ruth and Susie Williams, all of Oakland. She was a member of the Presbyterian church and one of the most popular matrons of Lawrenceville. 1. "Georgia Deaths, 1914-1927," The Church of Jesus Christ of Latter-Day Saints, FamilySearch.org - Free Family History and Genealogy Records. 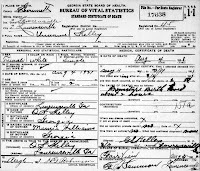 (http://www.familysearch.org : accessed 9 June 2011), death certificate image, Mamie Craig Kelley, 28 August 1921, no. 20349, Georgia State Board of Health Bureau of Vital Statistics. 2. 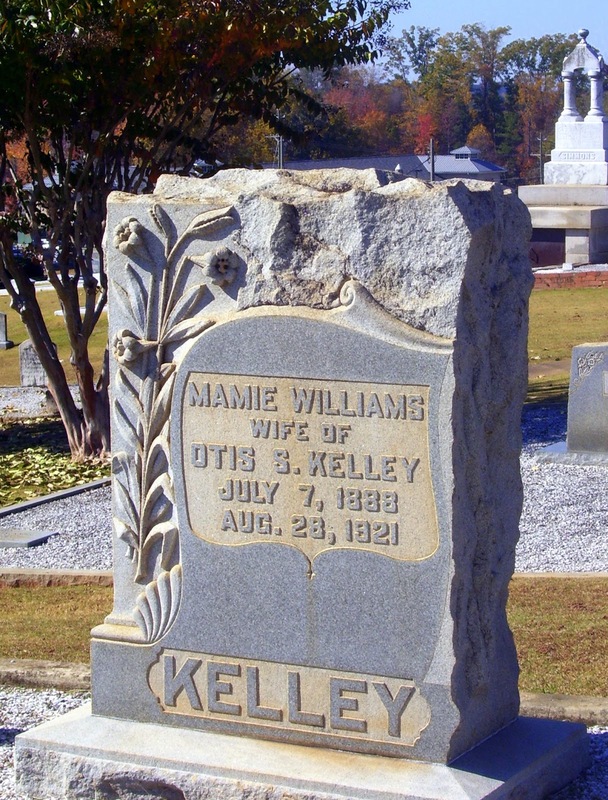 "Mortuary: Mrs. Otis Kelley," The Constitution (Atlanta, Georgia), 30 August 1921, p. 12; digital images, Ancestry.com (http://www.ancestry.com : accessed 9 June 2011), Historical Newspaper Collection. 3. 1920 U.S. census, Gwinnett County, Georgia, population schedule, p. 17A, Giles G. and Ada and Otis S. Kelly; digital image, Ancestry.com (http://www.ancestry.com : accessed 9 June 2011); citing National Archives Bureau of the Census Record Group 29. 4. FindAGrave.com, Fairview Presbyterian Church Cemetery, digital images (http://www.findagrave.com : accessed 9 June 2011), photograph, gravestone for Otis Kelley, Jr. (1921-1921), Lawrenceville, Georgia. 5. "Georgia Deaths, 1914-1927," The Church of Jesus Christ of Latter-Day Saints, FamilySearch.org - Free Family History and Genealogy Records. (http://www.familysearch.org : accessed 9 June 2011), death certificate image, Unnamed Kelley, 4 August 1921, no. 17638, Georgia State Board of Health Bureau of Vital Statistics. 6. 1920 U.S. census, Gwinnett Co., Georgia, pop. sch., p. 17A, Giles G. and Ada and Otis S. Kelley. 7. 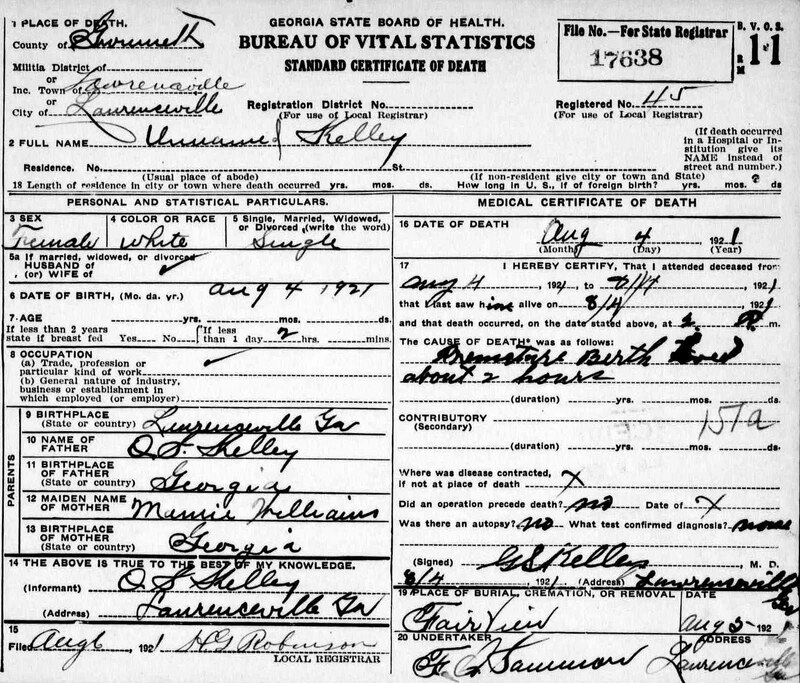 "Georgia Deaths, 1914-1927," FamilySearch.org - Free Family History and Genealogy Records, death certificate image, Unnamed Kelley, 1921, no. 17638. 8. "Mortuary: Mrs. Otis Kelley," The Constitution, 30 August 1921.